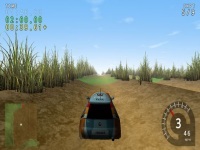 Trigger Rally brings the motorsport-rally simulation on public and open tracks. This contains over 100 maps to race on. Different on other type of car racing, you will not race together with other drivers. Instead, you will face a time limit on every track/event that you must achieve. If you can get to the finish point before the time limit, then it's a win.